Managed to come up with another pattern last night, yay! 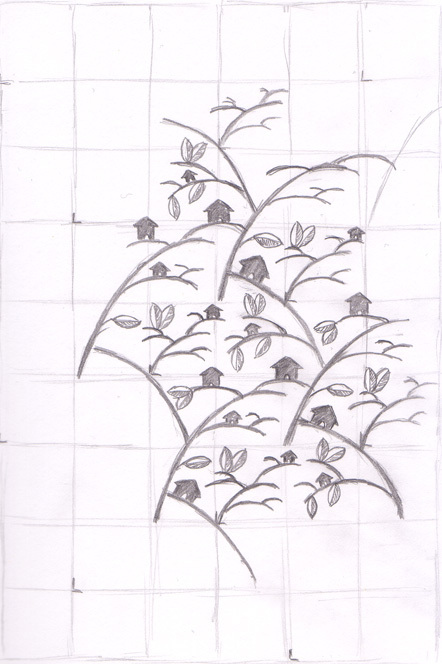 The idea was to do one that half looks like branches with leaves, and half looks like hills with houses on them. It ended up looking more like branches with little mini houses on them, but that's ok.
i may have missed it, but what are your future plans for your incredible patterns? they're wonderful and i'd hate it if they weren't seen, sold, or sewn...thanks to for including the how to sketches! I just happened upon your patterns on flickr and had to tell you how gorgeous they are! I might have to try my hand at some. Dopeattic - I'm still not sure what to do with them. I think i'll Gocco print them onto some cards/fabric but beyond that I'm not sure! This pattern looks very Japanese. Is this where you got your inspiration? 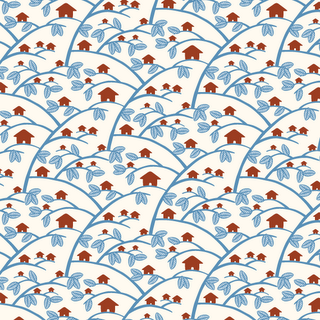 some patterns ... for the Gocco maybe?